When you visit running blogs with the highest monthly visits, click-through rates and rankings invariably they have one thing in common. Product Reviews. Runners love shopping for the next great thing. GPS Watches, Tights, Compression Clothing, Socks, Recovery products, nutrition and hydration products and of course running shoes. People want to run faster, longer, achieve goals and many of us look for that magic bullet when it comes to gear or equipment to get us there. Some of the greatest runners in the world have very little in the way of expensive or latest technology products fueling them. So in the end it all boils down to three things. Last time I checked, none of those came from a box, a running store or on-line. But what equipment can do for us is protect us from the most dangerous thing out there when it comes to staying healthy, training consistently and avoiding injury. We are our own worst enemy at times when it comes to training. Believing that if a 6-mile run is good for us as recovery mileage from a long run the previous day, 7 must be better. 8 better still. If a workout calls for 6 X 800 at half-marathon goal pace. 8 X 800 at 10 K goal pace must be better. And before you know it, we are overtrained or injured – and all that hard work has gone for naught. Shoes are such a personal choice that have a lot of variables that are unique to each runner. Height, weight, foot-strike, injury history, running volume, local terrain where you train, age, goals etc. – that for me to come out and say, “Shoe X is perfect for you”, is something I take very seriously. In fact this will make my 4th shoe review in 3 1/2 years. 4 reviews out of more than 575 posts and closing in on 1/4 million site visits. This is something I just don’t do very often. But when I find a pair of shoes that I feel are versatile enough and dynamic enough to “fit” different runners with different goals and perform at a high level, I think they warrant a discussion. With that disclaimer out of the way – let’s talk about the Brooks Pureflow 2. I have 12 pairs of running shoes in rotation right now. 4 pairs of race flats (5K, 10K, Half Marathon, Marathon), 4 pairs of mid to high mileage shoes (medium-long runs), 4 pairs of performance trainers (hill repeats, tempo runs, track work). Not sure if it is the fact that I am a carpenter’s son, where I grew up knowing that there was a tool for every job – and the best tools were specifically designed for a specific task. Akin to going to Home Depot and buying the latest Screwdriver-Wrench – where the tool is marketed to not only drive screws through wood, but it can also be flipped over and used as a wrench to turn nuts and bolts. What could be more convenient? The problem is all you bought was a crappy screwdriver and a crappy wrench all in one. Specificity can make all the difference in the world. The closet now holds shoes from Adidas, Asics, Brooks, Karhu and Mizuno. I am not searching for the “holy grail” of running shoe, I have just found that alternating the various types of shoes through my rotation keeps me healthy and racing well. But given the demands of our upcoming Big Cottonwood Marathon which is going to test our downhill running more than any race before – I knew I needed to search for yet another shoe to train in. One that would give me the lightweight, race-ability that I need to click off sub 7 minute miles for 3 hours, but also protect my forefoot and midsole from the pounding of running downhill mile after mile after mile down and out of Cottonwood Canyon. I stopped in to see my friend Adam at Rogue Running in Cedar Park and we talked about all of the options – and after trying on 4-5 pairs of shoes and running strides on the track inside the store I slipped into the Brooks Pureflow 2’s. 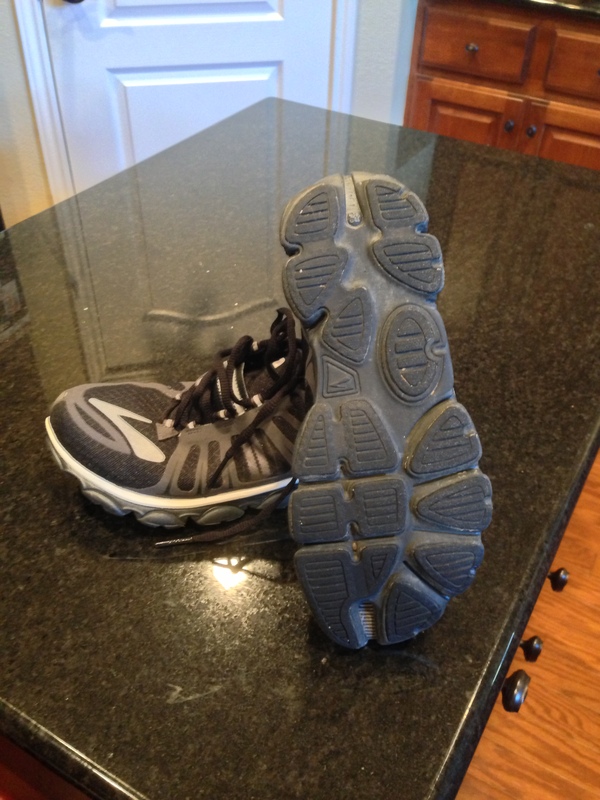 8.8 ounces, which is .2 ounces lighter than my favorite Marathon Shoe – the Adidas Aegis 2 (being retired). The Pureflow’s are very different than the Aegis however, in that they are much more flexible in the upper, and due to their lightweight construction “up top”, the shoe lacks a lot of the “structure” of a traditional running shoe. It allows the shoe to conform around your foot, as the NAV BAND wraps from your arch across the top of your foot. It makes the shoe more or less a custom shoe that will adapt to your foot as your foot adapts to the shoe. The shoe has a 4 mm heel-to-toe offset (18 mm heel, 14 mm toe). 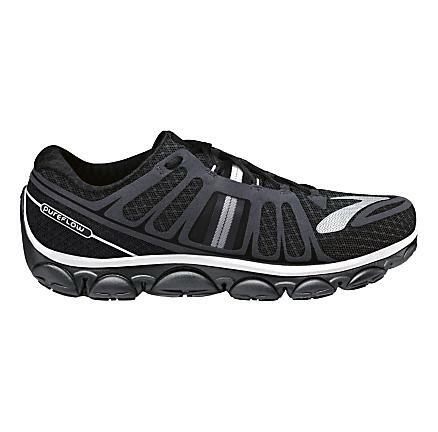 It is very responsive, makes you feel as if you are well connected to the road or trail and has a unique split front toe area on the sole of the shoe to allow for a strong toe-off when you are doing up-tempo work. It has all of the “performance” characteristics of a race shoe – but it has one thing that a lot of similar shoes I have run in previously do not. By using lightweight materials in the upper, Brooks is able to provide some pretty lush cushioning underfoot while not sacrificing feel and weight. The lush ride is especially prevalent in the midfoot and forefoot areas that when it comes to my race at Big Cottonwood may just be the recipe to help mitigate some of that downforce and save our quadricept muscles until later in the race. The toe-box is nice and roomy, something that even though I am a slender runner, my feet feel best in a shoe with plenty of room up front. The box is wide and very comfortable. One final note I want to mention is the sole on the bottom of the shoe has a shallow pattern, which has provided plenty of traction on the street, but has not picked up loose stone on the crushed granite trail – another great benefit for someone like myself who trains on both surfaces regularly. We have not had the shoes out in the rain yet or on slick streets, something that this time of year in central Texas, we many not get a chance to do for quite some time. I do not think traction would be an issue in those conditions – but in full disclosure, I have not put the Brooks Pureflow 2 through those paces yet. In sum, if you are looking for a lighter-weight, mid mileage trainer that is speedy enough to race the 10K to marathon in – the Brooks Pureflow 2 is absolutely worth a look at your local run shop. For runs right now 8-12 miles in length, they are the first pair of shoes I reach for in the morning. As always, your miles may vary. Fun read Joe – including the well-stated and intentioned disclaimers. Glad to see your initial impressions of the Pure-Flow 2 … As you may recall, I have been a huge fan of the original Pure Flow and give the shoe a lot of credit for the miles that I was able to accumulate in 2012 – mostly injury-free. Like you I have more then dozen in my rotation and prefer specific shoes for specific roles (for example the Green Silence for 5-K’s and shorter speed-oriented workouts) so when I find a shoe that works for me I tend to buy several pair as the shoe companies phase models out – or, at least “update” them about every 12 to 18 months. For the most part I try not to wear the same pair of shoes more then once a week in my rotation and have found this also seems to allow this bigger (and heavy sweater) runner to get more mileage out of each individual pair. I can no longer find the original Pure Flow and just recently started to run in my 5th and next to last pair ( as I still one more pair in an unopened box). 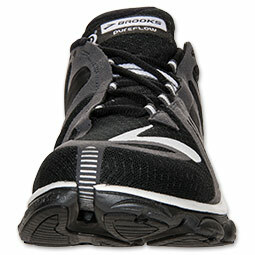 I won a certificate for a free pair of shoes from Brooks at the 2012 MCM and used to order my first pair of the Pure Flow 2 which I will likely use in the run up to and during my first 50-K, the Grand Cranberry Island Ultra [http://gciultra.crowathletics.com/] in late July. I hope I like them as much or more then the original – and, if so, I will be buying a few to set back for future use. On another front I got a bit of surprise coming up this weekend so wish me luck and ask Dom – if he isn’t too busy – to keep an angelic eye on me as I take a shot at an “off the cuff” goal with the full support of my wonderful wife, Patti. Speaking of which – best from Maine to Dawn and Landry, Looking forward to seeing at either Boston in 2014 or the ‘Burgh in 2015 (or both) … in the meantime keep rocking that training for Cottonwood. Thanks Jim! I wish I didn’t wait so long to try the Pure Flows, I’m really happy with them and yes, the more you rotate shoes, the longer they treat you right. It takes awhile to build up the inventory, but once you are there, I’m really jot buying shoes any more frequently than if I just ran in the same pair daily for 300-350 miles. As for Dom, he is a equal opportunity supporter :). I know he will be looking down on you and smiling this weekend. Best to you and your girls. And yes, absolutely Boston AND Pittsburgh!